What we can learn from the eclipse. Solar eclipses having been teaching scientists new things about the universe for millennia. This one could help us unlock some major mysteries. When humans first witnessed solar eclipses, they did not know what to think. In South America, they believed giant jaguars were chasing and catching the sun. In Scandinavia, it was demon sky wolves. In ancient Hindu mythology, the darkness was caused by the god Rahu devouring the orb. If Earthlings made a riot loud enough, sometimes they were able to scare Rahu enough that he only ate a part of it, leaving a sliver of light visible in the sky. Today, we know that a scared Rahu actually meant a partial solar eclipse—and no human intervention would have made a difference. We learned this after centuries of human observation and scientific advancement. And on Aug. 21, when North America witnesses its first total solar eclipse in the region in nearly a century, we’ll be hoping to learn a little more. The continent’s residents are already gearing up for the event. It’s estimated that approximately 12 million people live in the “path of totality”—that is, the stretch of land where viewers can witness the moon eclipse the sun perfectly, which will blot out all light from the sun, except for the ring of its corona. The eclipse will begin at 9:05 a.m. PDT at Lincoln Beach, Oregon, and stretch across the country to near Charleston, South Carolina, where the phenomenon will conclude at 2:48 p.m. EDT. * Hotels and campsites along the path of totality have been booked for months. 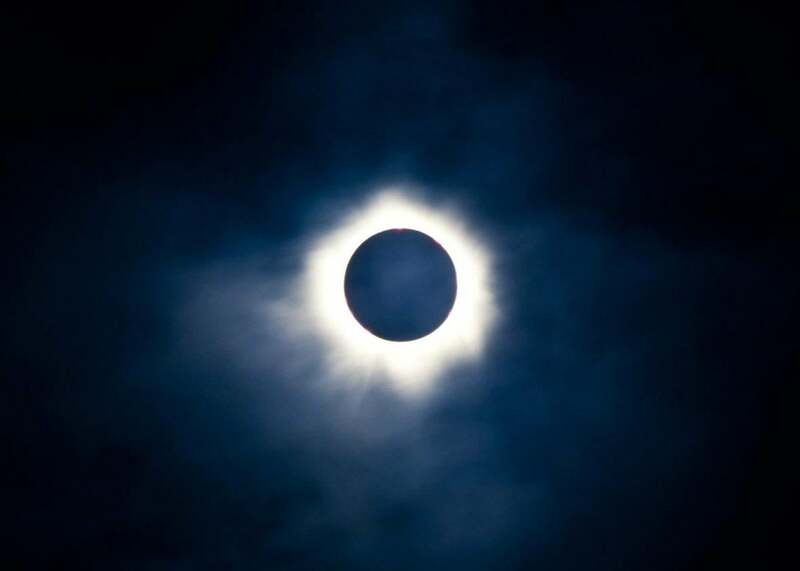 Depending on where you are, the eclipse’s total darkness will last around two minutes; in Carbondale, Illinois, viewers will be able to see it the longest, for about 2.5 minutes. That sounds like a short amount of time, but history proves how much we still could learn. According to NASA, the first known written records of people paying attention to eclipses are from around 5,000 years ago. It wasn’t until some 2,600 years later, around 500 B.C., that Greek philosophers like Anaxagoras began figuring out that eclipses were simply the play of shadows. By 425 B.C., there was evidence that Babylonians could predict them. * In a total lunar eclipse, for instance, the Earth moves between the sun and the moon, casting a shadow on the moon. Seeing the consistently round shadow is what caused Aristotle to conclude that the planet had to be spherical. “I’d say that’s really the first big scientific result about our place in the universe, was figuring that out,” says Tyler Nordgren, the author of Sun Moon Earth: The History of Solar Eclipses From Omens of Doom to Einstein and Exoplanets. Eclipses have helped us reach many other conclusions that seem rather obvious now. Anaxagoras used solar eclipses, where the moon is moving in front of the sun, to conclude that the sun had to be farther away than the moon from Earth. British astronomer Francis Baily made the first detailed observations that the sun’s corona (its outer atmosphere) and prominences (large features extending from the surface) were in fact part of the sun and not the moon, because he was able to see the moon moving across the corona during solar eclipses. Scientists were even able to prove Albert Einstein’s theory of relativity was accurate using an eclipse: Photographing the stars near the sun during and after a 1919 total solar eclipse over South America and Africa, the scientists determined the stars did seem to move position, meaning their light was likely being bent by the sun in four-dimensional space-time. To say scientists are excited by the possibilities offered by this month’s eclipse is an understatement. Eclipses—solar and lunar, partial and total—do occur every few months, but the areas from which we can see them are basically random and often end up being over oceans or on very small swaths of land. (There will be another solar eclipse over North America in April 2024, but that one will still be over a smaller stretch, its path of totality from Texas to New England. *) This year’s is ideal because this stretch from Oregon to South Carolina is all land, and summer means a better chance of clear skies and clear observation. Overall, the occasion of a total solar eclipse allows scientists a unique opportunity to observe things about and around the sun that we normally can’t see because of, well, sunlight. Namely, blocking out the sun will allow us to explore the sun’s corona, Mercury, and nearby stars in more detail. We might learn more about stars in general—how they form, what other stars circling habitable planets might be like, and so on. “We know a lot about the sun, and yet there’s so much basic fundamental stuff we still don’t know,” says Amir Caspi, an astrophysicist at the Southwest Research Institute. For one, there’s the mystery of why the sun’s corona is so hot. While the visible surface of the sun is about 5,500 degrees Celsius, the corona, just beyond that surface, is more than 1 million degrees—and no one knows for sure why. According to Caspi, one of the leading theories for how energy gets to the corona is something called wave heating. Think of how radio waves in a microwave don’t actually generate heat but can cause the water molecules in your food to vibrate, which heats them up. The idea of wave heating suggests that something similar might be happening with waves coming out of the sun’s magnetic field. Another leading theory is that the sun’s corona contains nanoflares—like solar flares but so small you can’t see them individually—that are like little firecrackers exploding across the corona all the time and all at once, generating a constant source of heat for the outer layer. But no one knows for sure, which is one of the reasons Caspi, the principal investigator on a NASA-funded mission to observe the eclipse from the air, will be studying the sun’s corona closely. On Aug. 21, two WB-57s—long-wing bombers that NASA has repurposed into research aircraft—will fly at a high altitude from St. Louis to Nashville to chase the eclipse’s shadow. As opposed to the two minutes that people on the ground will be able to see the full eclipse, those on the aircraft will be able to see it for between 7-7.5 minutes. * Telescopes and cameras onboard the planes will be capturing the eclipse at high speeds, hopefully fast enough to catch something that might indicate whether the wave or nanoflare theory, or a combination of both, is true. The mission also hopes to capture some information on why the loops and streamers coming out of the corona seem to work in a concerted, organized way and also take some rare thermal images of Mercury. Another NASA-sponsored study, meanwhile, will be spending the eclipse trying to observe Earth’s own upper atmosphere, specifically the charged layer called the ionosphere. The ionosphere is only very charged during the daytime, when energy from the sun and its corona feed extreme ultraviolet photons into this area, creating free electrons and ions. At night, with no sun, the ionosphere is much less charged. But during an eclipse, the sun essentially turns off and back on again very quickly, says physicist Philip Erickson. And observing this rapid succession of events is more useful than any sort of modeling scientists are usually able to do. Scientists are interested in the ionosphere and its chemistry because it affects our radio-wave communication here on Earth and how well we can communicate with the spacecraft and satellites orbiting in space and beyond. If scientists can use the ionosphere to predict space weather conditions—Erickson compares it with what meteorologists do with regular weather, but much, much more complex—we can be better equipped to handle any major events that might disrupt our satellites or our communications grid. On Aug. 21, Erickson and his team will be based at the MIT Haystack Observatory in northeastern Massachusetts, using its sensitive instruments—which have improved greatly since the last eclipse—to study how fast the electrons go away when the sun disappears behind the moon and how quickly they return. Not all the science being done during the eclipse requires fancy equipment like WB-57s or the Haystack telescope. Citizen science projects across the country are looking for all kinds of help from regular people in and outside of the path of totality. GLOBE Observer, for instance, is a mobile app you can use to photograph clouds and record sky observations before, during, and after the eclipse, which will later be compared with NASA’s own satellite images. Google and UC–Berkeley are asking for images from all points of the eclipse path to make a high-definition, time-expanded video of the entire event, called the Eclipse Megamovie 2017. The California Academy of Sciences’ Life Responds project, meanwhile, allows users to contribute their observations of animals and plants during the eclipse through an app. * (NASA has also compiled a handy list of some notable citizen science projects here.) Contributions and observations from people in all areas of the eclipse zone will likely provide an unprecedented bounty of data for scientists. And if you need some motivation for doing so, remember the long-term goals of this research: Learning about the sun and its effects on our Earth tells us a lot more about the habitability of our universe. “If you want to be a space-faring society, the first thing you have to understand is: What’s the environment that you’re going into, and how do you make sure that you’re safe in it, and how do you make sure that you can operate around in the way that you need to,” Erickson says. Perhaps one day humans will be able to witness awe-inspiring eclipses from other planets or moons—but to get there we’ve got to put in the work here on Earth. *Correction, Aug. 8. 2017: This article originally misstated when the next eclipse will be (it will be in 2024, not 2028) and how long people in airplanes will be able to see the eclipse (7-7.5 minutes, not 4.5 minutes). It has also been updated to clarify the timeline on when scientists discovered certain things about eclipses and when the eclipse will start. *Update, Aug. 16, 2017: This post originally stated that Life Responds is an app—it is a project that makes use of an app.